Posted April 6, 2018 . Filed under News. On the 27 March 2018, The Innovation South Showcase was held at the all new Farnborough International Exhibition and Conference Centre. Innovation South is a new collaboration between the government and industry to promote the skills and strengths of the South of England’s economy. Innovation South, is an alliance of companies, Universities and public authorities spanning eight Southern counties from Dorset to Kent, who have come together to champion and promote the South of England as a powerhouse of digital technologies, innovation and international trade. 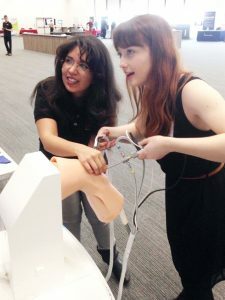 Invited by Dorset Local Enterprise Partnership to represent Dorset, ORI showcased their current virtual reality surgical simulator and other works across universities, local hospitals, industry partners and the community.